Home to Mount Rushmore National Memorial, South Dakota is an ideal fall vacation destination. The autumn season brings crisp mornings, cool evenings and an array of majestic gold, orange and crimson colors. Fall also ushers in exciting events like the Custer State Park Buffalo Roundup and Arts Festival and Rooster Rush, the opening of pheasant hunting season. Plan trips for great hunting, fishing, hiking, golfing, camping and many many more, these are just a few of the great things that you can do in South Dakota. The Black Hills, Badlands and Lakes region has unique scenery and one of the largest concentrations of National Parks, monuments, memorials and caves in the Midwest. The Western Region, or Black Hills, Badlands and Lakes Region of South Dakota, offers majestic granite spires, pine covered peaks and unique rock outcroppings. Named “Paha Sapa” by the Native Americans, the Black Hills are full of scenery, adventure and rich history. With one of the largest concentrations of national parks, monuments and caves in the Midwest, you’re sure to discover the places that capture the spirit of America when you vacation in the Black Hills. South Dakota’s Great Lakes provide over 440 miles of waterway for boating, fishing, sailing, swimming and windsurfing on the Missouri River and Reservoirs.Beginning in the late 1940s, the Missouri River was dammed to create four massive reservoirs – Oahe, Sharpe, Francis Case, and Lewis and Clark. Together these massive bodies of water make up South Dakota’s Great Lakes Region, providing over 440 miles of waterway for boating, fishing, sailing, swimming and windsurfing. Here you can follow in the footsteps of Lewis and Clark, experience Native American heritage and kick back on the over 3,000 miles of shoreline. If you love the great outdoors, you’ll love the fresh glacial lakes and prairies of northeastern South Dakota. If you love the great outdoors, you’ll love the fresh glacial lakes and prairies of northeastern South Dakota. The Glacial Lakes and Prairie’s Region offers unique family attractions, camping opportunities and plenty of outdoor adventures for kids of all ages. You’ll also find frontier history, plentiful walleye and one-of-a-kind events. In southeastern South Dakota, every landmark tells a story and every event captures the spirit of the people. In the Southeastern Region of South Dakota, you’ll find 175 fishing lakes ranging in size from three to 29-thousand acres. You’ll also find bustling cities, quiet country escapes, fine arts and culture, family attractions and abundance of outdoor adventures. Here every landmark tells a story and every event captures the spirit of the people. 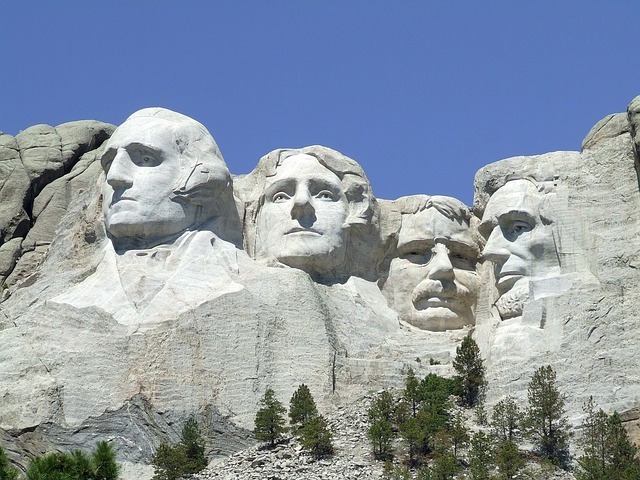 This epic sculpture features the faces of four exalted American presidents: George Washington, Thomas Jefferson, Theodore Roosevelt, and Abraham Lincoln. South Dakota’s Black Hills provide the backdrop for Mount Rushmore, the world’s greatest mountain carving. These 60-foot high faces, 500 feet up, look out over a setting of pine, spruce, birch, and aspen in the clear western air. Corn Palace, Mitchell, South Dakota. During the summer months the Corn Palace offers free guided tours led by friendly guides full of a-maize-ing facts. (Like how many nails and staples are used in the decoration process.) The tour also features an outstanding video explaining the Corn Palace Story. After the tour you can view displays about the Corn Palace, how the murals are created, souvenirs and entertainment from the past and how the corn is grown. Experience the original Surveyors’ house written about in Laura Ingalls Wilder’s book “By the Shores of Silver Lake”. Learn a lesson in the original First School of De Smet, which Laura and her sister Carrie attended. Visit the home that Pa built on third street, the last home that Ma and Pa lived in. These three historic structures are filled with original historic artifacts that belonged to Laura Ingalls Wilder and her family. Discover Laura, your “Little Town” adventure starts here. Located in the heart of De Smet, SD, one block east of the courthouse.